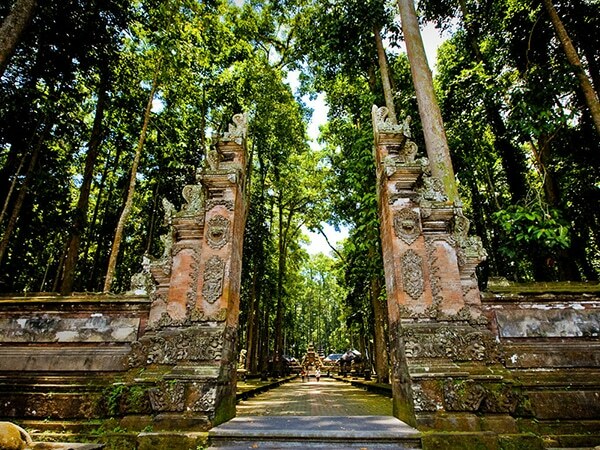 What is the sacred Monkey Forest Ubud? 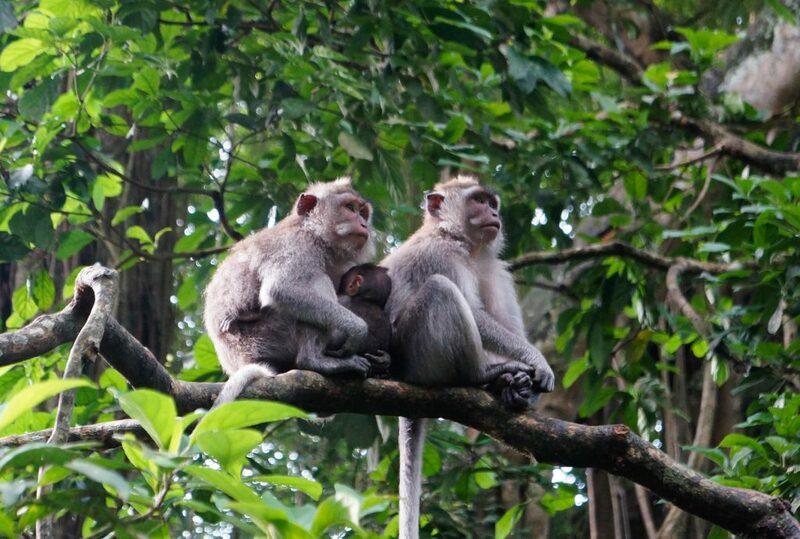 This is a natural forest that is home to long tailed Balinese monkey, that are also known as Macaca fascicularis and it’s an awesome Ubud tourist point that you should really check out on your travels. 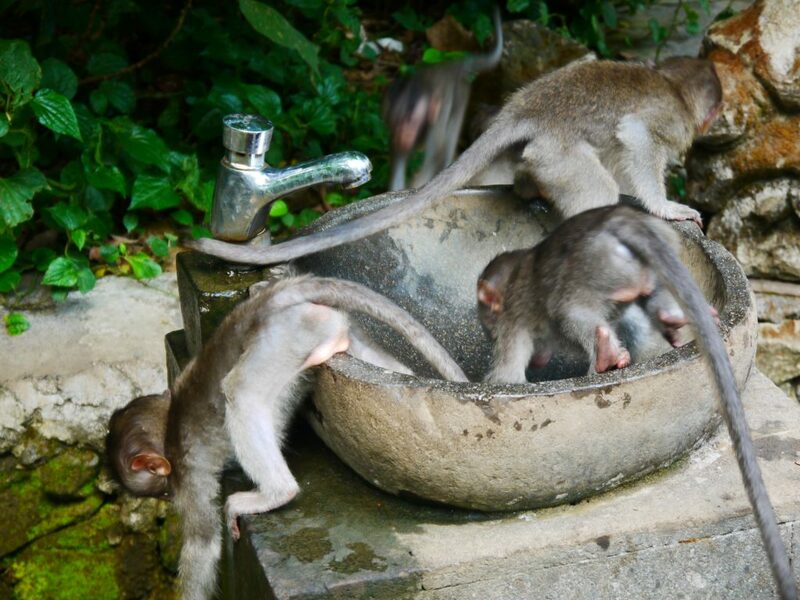 The Bali monkey sanctuary is located in a perfect place near to the Ubud town centre, the tegalalang rice terraces and the amazing waterfalls in Bali. 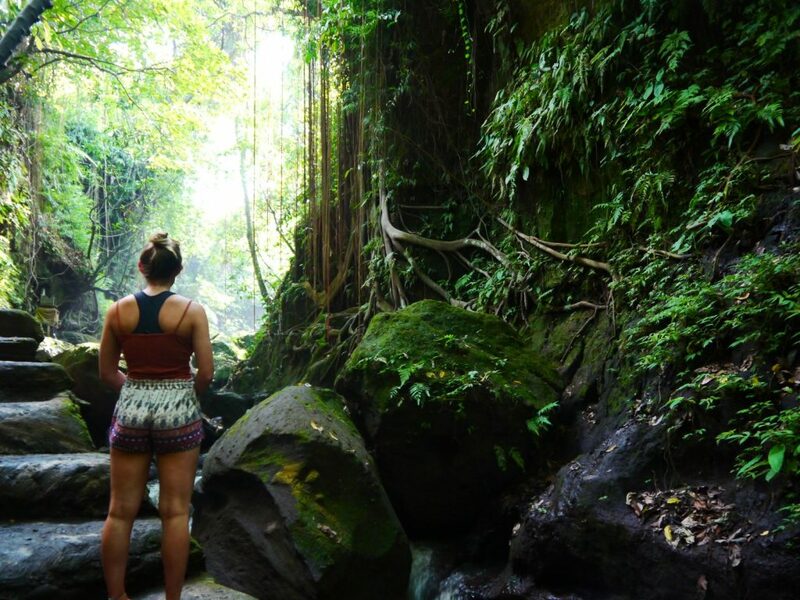 Ubud is a perfect place for all backpackers and travellers. 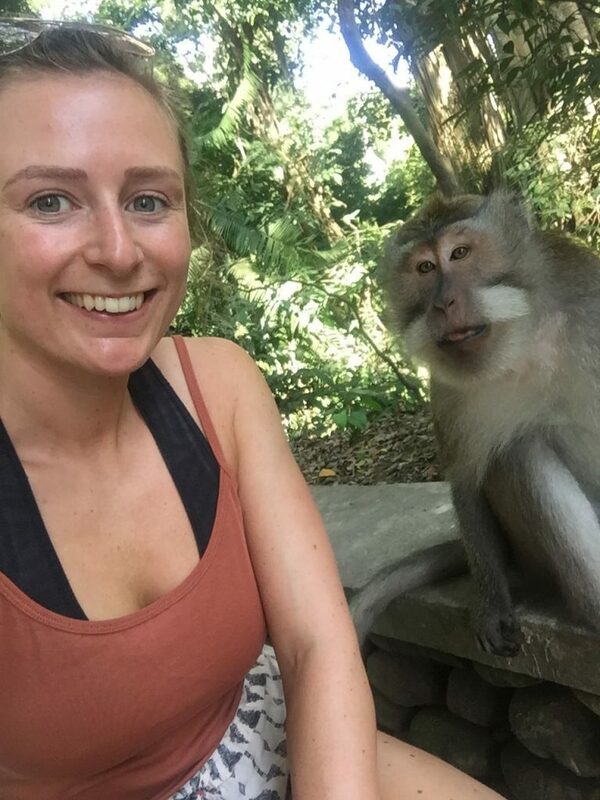 There is some amazing places to stay in Ubud and we spent 2 weeks here whilst backpacking around Bali and seeing the monkeys was one of my favourite things to do, they’re amazing and fun. Sacred Monkey Forest Entrance Fee? How much does it cost to enter the sacred forest? entrance fees for adults is 40,000 Indonesian Rupiahs which is roughly $3 and children 30,000 rupiahs $2.25. Also, you can buy bananas to feed to the monkeys while you walk around. Bananas will cost you around 40,000 IDR. How to book your tickets? I would use TripAdvisor and book your tickets online in-advance. 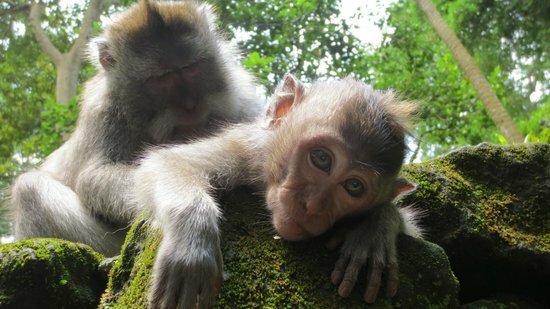 Is the monkey forest Ubud safe? Is the monkey forest safe? Yes of course, just follow the rules of the sanctuary and you will be totally fine on your visit. 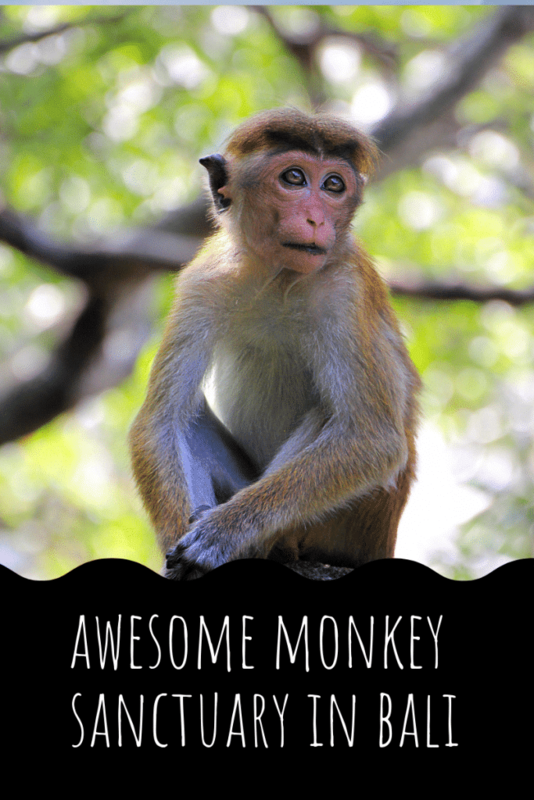 Furthermore, about 749 monkeys live in the Ubud sanctuary and they all are free to roam around and it is well looked after and totally safe, just remember to keep your loose items hidden. With all the tourist points in Ubud, as long as you foll the rules and have your common-sense, then you should be fine. The Sacred Monkey sanctuary is a famous tourist attraction in Ubud. 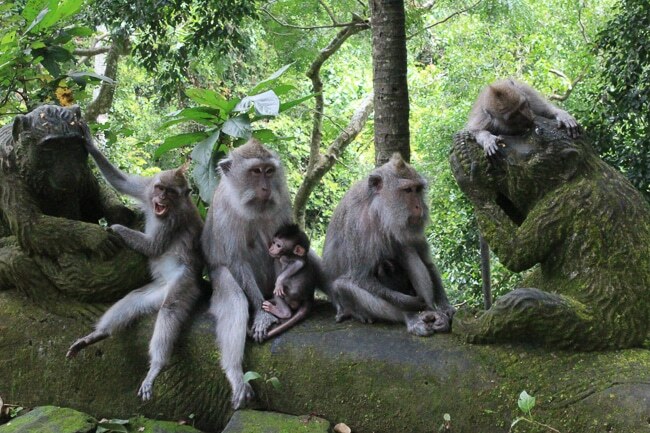 In every month there around 120.000 visitors comes to Ubud to see the monkeys. The Forest has 186 species of the plan and tree in 12, 5 hectares of the forest. What is the monkey forest dress code? There is no rules saying what to wear, However, don’t wear loose valuables such as cameras etc. Too many tourists have had their goods stolen from the monkeys. You have got to remember that the monkeys are wild, they’re not there to follow rules, so if they see somethings they want to take, then they won’t hesitate to take your goods. 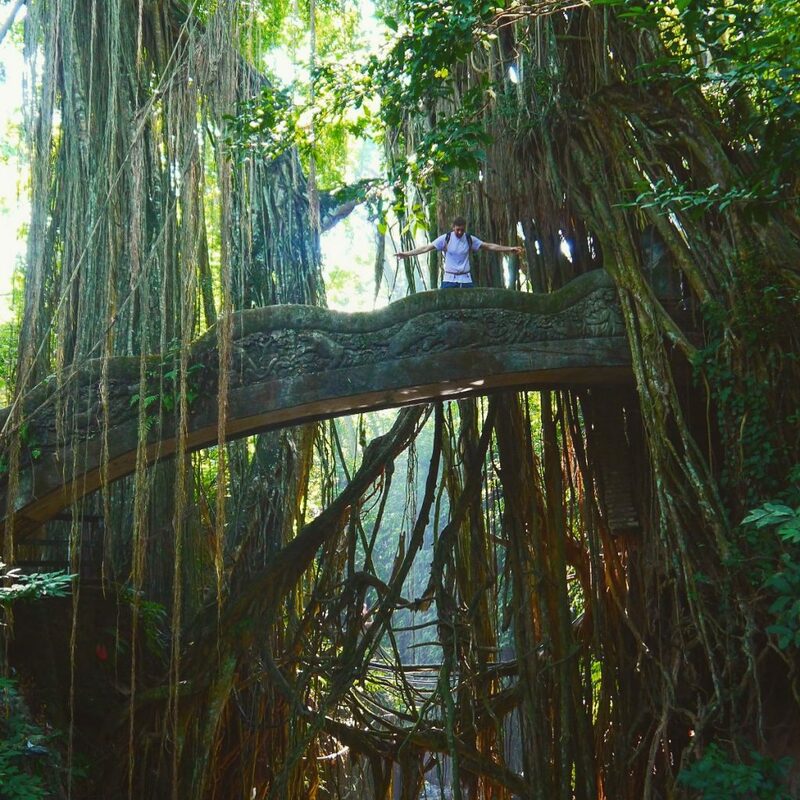 There is another super-cool forest to check out, the Sangeh monkey forest in Bali. 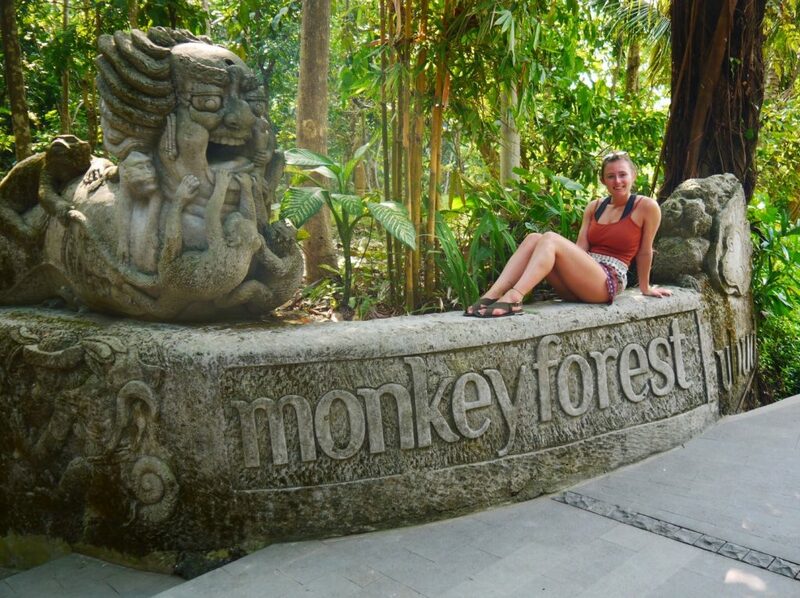 This is something sort of similar where you can get up close to the monkeys and explore their natural habitat. The Balinese Long Tailed Monkeys are important in Balinese culture, portrayed in the “Ramayana” Hindu-based dance epic, the “Kecak” dance, carvings and other art. And the Forest isn’t just a popular tourist attraction – it’s actually a sacred site. You get this vibe upon entry, it as a mega set-up and you will appreciate the effort they put in to make this a top thing to do in Ubud for you. It was nice to see that the monkeys, who are the owners of the place, are well looked after in the reserve and to be fair they are the bosses! We removed our watches and jewellery before visiting, we were warned that the monkeys were trying to remove their earrings or other jewels, thinking it was food or something fun to play with. Also, I highly recommend removing your items as we heard so many stories of tourists losing their goods. Upon entry to the monkey area in Ubud, the monkeys will probably come to greet you straight away and try to look for any loose bananas or other food items you have. Many people who have visited the sacred forest have lost their cameras, phones and other valuable items to these little monkeys. The Bali monkey forest staff advises visitors to never remove a food offer from a monkey or to touch it, as any of these actions can cause an aggressive reaction from the animal. And, although they usually ignore humans who think they do not have food, they sometimes confuse the actions of a human being with a food supply or an attempt to hide food. If a human does not provide the food required by monkeys or does not provide it fast enough, he will occasionally bite it. In reality, monkeys bite tourists every day. Don’t worry though about any monkeys as everything is safe and there is plenty of staff around to make sure kept safe. The monkey sanctuary Ubud covers about one-tenth of a square kilometer (approximately 10 hectares of 27 acres) and contains at least 115 different tree species. The park is very wooded and mountainous. A deep ravine crosses the park, at the bottom of which flows a rocky current. The trails allow visitors to access many parts of the park, including the ravine and the creek. The lands of the Monkeys include a forest conservation area, a public hall and a gallery, an outdoor stage, a canteen, a first aid center, a police station, car parks and toilets and composting. Bali temples host three Hindu temples, all apparently built around the year 1350. Pure Dalem Agung Padangtegal (“The Great Temple of the Dead in Padangtegal”), also called the main temple, is located in the southwestern part of the park. The temple is used to worship the god Hyang Widhi in the personification of Shiva, the recycler or the transformer. The Pure Beji, or Beji Temple, in the northwestern part of the park, is used for the cult of Hyang Widhi in the personification of the Gangga goddess. A temple immersed in the “sacred source” is a place of spiritual and physical purification and purification before religious ceremonies. The Pura Prajapati Temple, or Prajapati, located in the northeastern part of the park, is used to worship Hyang Widhi during the personification of Prajapati. A cemetery adjacent to this temple receives the body of the deceased for temporary burial pending a cremation ceremony that is celebrated once every five years. Temples play an important role in the spiritual life of the local community and the monkey and its mythologies are important in Balinese artistic tradition. The monkey forest area is sanctified by the local community and some parts of it are not open to the public. The sacred areas of the temples are closed to all, except for those who wish to pray and wear the proper clothes of Bali. The temple of the sacred spring is descending a long staircase next to a stream in the jungle forest. To access it, cross a moss-covered stone bridge that crosses the stream; The long fig screws hang over you and underneath. There is plenty of great accommodation in Ubud and you can find luxury and cheap places to stay in Ubud. Also, the hotels and home stays in Ubud cater to all types of visits and Ubud is a perfect place for backpackers and honeymoon holidays. The accommodation in this amazing place offers epic budget rooms and some amazing luxurious hotels for those of you wanting to experience a more luxurious stay in Ubud. Hanging gardens of Bali – The Hanging Gardens of Bali is a sweet-luxurious destination, which you will find located in the jungle. It is situated near Payangan, a village North of Ubud. Also, the enchanting five star luxury resort has 44 private suites and individual villas. The hanging gardens of Bali suites all have their own granite infinity pool, amazing. Banana Homestay – This homestay in Ubud is in perfect location and it’s within walking distance with all the top things to do in Ubud and this homestay offers very clean and comfortable rooms. Also, these come with hot showers, free tea and coffee all day long. There is also free breakfast included with this homestay in Ubud and the service here is also amazing and you will feel very welcomed on your stay. Also, the Wifi is very good here, always a tip essential, overall making it a top place to stay in Ubud. Undis Homestay – This is another great cheap place to stay in Ubud. It’s a budget homestay that offers amazing service, clean rooms and free tea/coffee and there is a good view of this homestay and you can even get a view of the flowing river that runs by it. 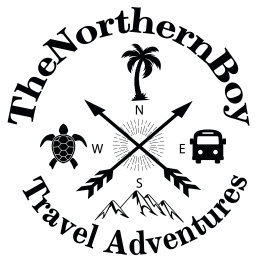 Also, you will be treated very well at this budget accommodation in Ubud and this is definitely a top place for backpackers to stay. Ubud village hotel – If you are looking for a more luxurious place to stay in Ubud, then this is definitely it and this is a classic Balinese hotel that is in perfect walking distance to most of the main attractions in Ubud, as it’s located in a great spot between the monkey forest and the town centre. Also, the rooms at this top hotel in Ubud are large and very clean and you will receive a great Buffet breakfast and plenty of tasty fruit to set you up for a great day out in Ubud. 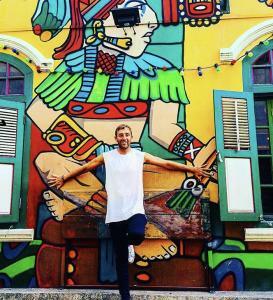 We had a mega time visiting the sacred sanctuary as you can see from this post. The Balinese monkeys are so much fun and will keep you entertained for however long you stay at this top tourist attraction in Bali. Treat monkeys with respect; they are wild creatures that could bite. 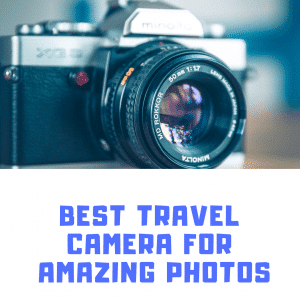 Keep the camera handy and keep your stuff. Do not wear jewellery, watches or anything that you might regret losing. You can buy bananas at the gateways to feed the monkeys. But be careful if you do. They will jump over you to reach the plane trees; you can feel them even if they are hidden in your backpack.